Home » » Movie Under the Stars on July 4th: The Princess Bride! Movie Under the Stars on July 4th: The Princess Bride! Home for the Holiday? 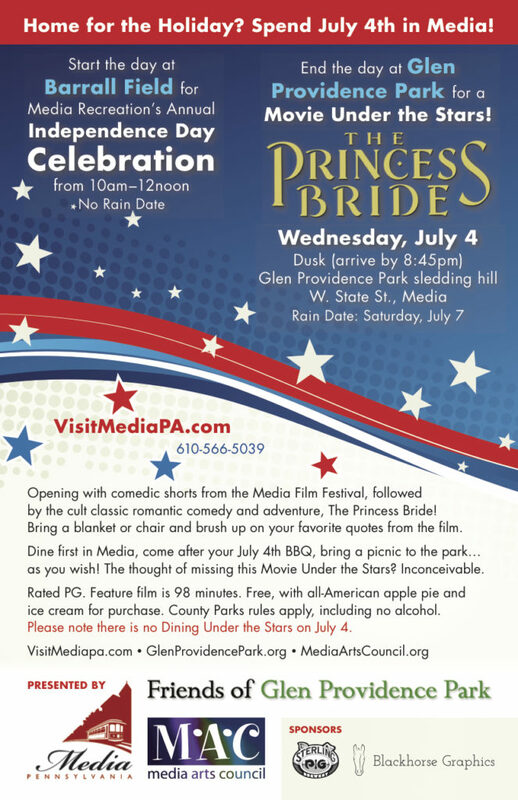 Spend July 4th in Media! Start the day at Barrall Field for Media Recreation’s annual Independence Day Celebration from 10am-12noon. End the day at Glen Providence Park for a Movie Under the Stars! Opening with comedic shorts from the Media Film Festival, followed by the cult classic romantic comedy and adventure, The Princess Bride! Bring a blanket or chair and brush up on your favorite quotes from the film. You can dine first in Media, come after your July 4th BBQ, or bring a picnic to the park… As You Wish! The thought of missing this Movie Under the Stars? Inconceivable. Rated PG. Film is 98 minutes. Free, with all-American apple pie & ice cream for purchase. County Parks rules apply, including no alcohol. Please note there is no Dining Under the Stars on July 4. Presented by the Media Business Authority, Media Arts Council & Friends of Glen Providence Park. Thank you to sponsors Sterling Pig & Blackhorse Graphics, and to Delaware County Parks & Recreation for the permission, power outlets, and portalet!